Well, my tactical training course is quickly approaching and I have almost completed my gear roundup in preparation for it. The last thing remaining is a Molle Vest (sometimes called a plate carrier for its ability to carry ceramic composite protection plates within its pockets). I have searched the internet and found a plethora of vests. It is actually a bit overwhelming. The prices range across the board from sub $100 to over $500. Obviously, the adage of "You get what you pay for." has some relevance here. #1. Must have ability to carry mag pouches and dump pouch. #2. Must be versatile (molle design vs. fixed pouch) to allow changes to be made to layout of pouches. #4. Will likely only be used for tactical training. #5. Should/could have professional quality so that I can ramp it up to an actual plate carrier for SHTF scenario rather than having to repurchase one of higher quality. 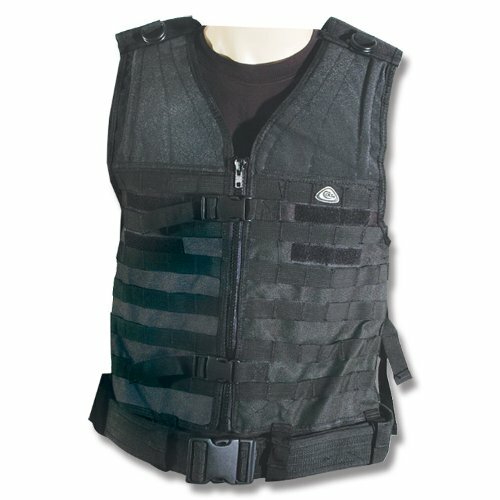 There are other "off" brands (Amazon search for "molle vests") that will likely serve the training purposes, but do not seem to be of the highest quality. I would like to know what you guys have used and/or recommend. Links and pictures would be appreciated. Your needs may differ from mine. But I have come to the realization that i want as little junk as possible. I dont know what your Tactical Training will teach but if you look at the trend setters like Travis Haley and Chris Costa look at the gear they and their students use. Very rarely do they use a vest plate carrier. All reloading is done off the belt. This has to do with muscle memory for multiple weapon platforms. Efficiency of motion is critical. I do use a simplified vest called a chest rig, it is like a cummer bund of molle with a small panel on top making an upside down T. I used it for my Shotgun shell caddies for 3 Gun. Since my belt like was hogged up by AR mag and pistol mags. Right side holds my Glock 21. At most you will need three mags to operate sucessfully in the class. And realistically, any real engagement will only require 1 mag to end the fight. Loading up with all the gear gets heavy FAST and uncomfortable. Unless you train with it ALL the time. If you are serious about getting a plate carrier get invited to the Cooll Guy Yard Sale on facebook. It is a private group of 3000+ guys who sell or trade used gear. There are a few vests on there now. I cant recall black but doesnt hurt to join and ask for one. Just heed the rules. Their new courses will be listed in mid to end of November. These are the guys you referenced, right? On there, I see some Molle vests, although not all. :: Blackhawk Tactical RH holster (for Sig Sauer P226 Tacops) with two CF mag holders that flank the holster fore and aft on the leg. My thought was to go with the Molle Vest and relocate the triple mag pouch from the belt to the chest and possibly add another. Wrong move? Sorry for the late reply. Anyway I would not recommend reloading from your vest. But that is just my thoughts and experiences. I try to get the KRISS reloaded as fast as possible. Get the Art of the Tactical Carbine DVD and watch it. They dont really recommend reloading from the vest. You can of course use the vest to store extra mags but you should be reloading from your left hip. Do some research and check out what setups 3Gun competitors use. I guarantee you that is the most developed and efficient setup. It is all about efficiency to save time. Now granted, they only have to have enough rounds to last a single stage. So they are not really loaded up, but the point I am making is about speed and efficiency. Try the setup the way you want to. Don't just listen to me. Try practicing a speed reload with the mags on your chest rig. Think about how things will slow you down, such as flaps that cover the mags, the angle at which you can remove the mags. Unless you are going to fast rope head down from a tall building or helicopter, there isnt any real need to have pouch flaps. If you move around and your mags fall out. you bought bad mag pouches. Also I would recommend shooting 13 or 10 rd mags more than the 30rd happy sticks. The 30 rd, sorry I mean 25+ rd mags, are great for continous shooting and if you want to focus on sight alignment and trigger pull more then use them. However you want to eliminate what ever will slow you down and keep the gun from operating. In this case your reload may be your weakspot. Since living in NY, I have to shoot 10 rd mags. I actually like shooting with 10 rd mags at competition because I go thru them so fast that I have to reload 2 or 3 times a stage. It is just more practice reloading the KRISS and it have become invaluable. Having recorded most of my matches with the KRISS I have seen steady improvement in my reloading time and efficiency. I AM reloading from my left hip. Item #3 in my list. I have a triple tectical leg mount mag holder on my left leg. As for pouch flaps, in general I agree, however, I have been told that kneepads are a good idea, as well as elbow pads. I bought a pair of Arcteryx knee pads and they are absolutely spectacular. I mention this because I was told I will be dropping to my knee and then going prone on the ground. I felt that may be a cause for a mag to come loose. Again, just a precaution. However, the mag holders I have do have the ability to have the closure flaps velcroed open, so I am good either way. Regarding the extended mags, I have the standard ones of course. My friend is in Florida and that is where this course is. He has the extended mags and I was going to use them in combination with the standard mags. THis is my first time doing something like this, so I guess I will see what works and what doesn't. I did buy the Art of the Tactical Carbine. I am waiting for it to arrive. In the meantime, can you explain why they, and you, recommend against a chest rig? I would like to hear the philosophy. There is nothing wrong with a chest rig. It is a place to store stuff that is all. It is like your garage. You store stuff in it but you dont do you business from there. As you go thru your hip supply, you re-supply the belt line from the extra mags in the chest rig. Just try to do a fast reload from the the hip and from the vest. The hip is always faster. Knee pads is a good idea. Elbows are ok, but I did not find myself on the ground as much as I did on one knee. I use Alta kneepads. I think you will find that the belt rig you have mayl be uncomfortable in a short matter of time. The biggest problem is all the weight is supported by that one strap hanging off the belt. Better leg panels have two vertical mounting straps to evenly distribute the weight. With a single mount strap, it will pull on your belt and will start to slide down and you will be repositioning it a lot. This is all from years of airsoft experience. Many many hours out in the field fiddling with gear that doesnt work. If possible try to move the thigh rig higher. When I did it, I just looped the belt right above the panel. Sort of like Chris Costa's sub leg rig. It doesnt hang so far down. Also by having the leg rig so far low in the standard configuration, you have to reach further down to get at the mags. Watch this video. Stage 3 you can see my reloads. They arent the best but still pretty quick than before. Check out Costa's Leg Rig. Slick and efficient. Two carbine mag pouches with three pistol pouches. This is really all you need. Depending on the course and the instructor, you will usually go thru 2-3 mags then stop so everyone can top off their mags. It is highly unlikely you will go thru 5-6 30 rd mags in one session. This is usually due to the fact that most people dont have that many mags and carrying that many rounds gets heavy fast. Did you get a sling? I prefer single points but there is the risk of covering your foot with the barrel. As opposed to a two point sling, it can hang diagonally in front of you and pointed at the ground safely. Oh another thing you need to really be aware of is that the KRISS does not like full mags on a closed bolt. It is extremely difficult and unreliable to insert a fully loaded mag when the bolt is closed. You can download 1-2 rds. I find it better to just always open the bolt and lock it before inserting a fresh mag. I have spent many times jamming topped off mags on a closed bolt and it just wastes time. None of these photos are of my actual equipment, just internet photos that I found that are the same, or similar to, my equipment. THe only exception is the quick disconnect I installed on my Kriss stock. i have a Blackhawk 2" duty belt. 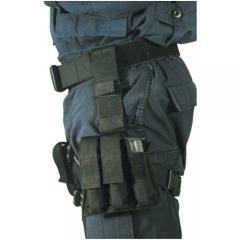 I have the Blackhawk tactical leg holster which has the two hanging straps you mention. It is for my Sig Sauer P226 Tacaops. It looks like this internet photo, and I also have the magazine holders in front and back of the holster as in the picture. Those two mag holders will ONLY be used for spare mags, not for active reloads. Read on..
Again, Blackhawk product as shown. But after seeing your link to Costa's rig, I will try to raise it up. This is strictly for the extended Kriss mags. This holder will be mounted directly to the belt, on my left side. It will hold 3 reload mags for the Sig Sauer P226 Tacops pistol. 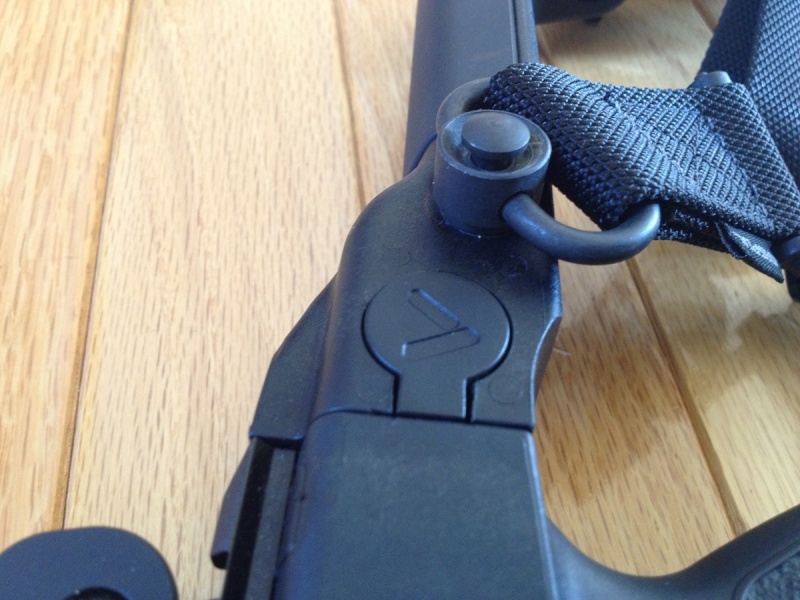 As you saw in my other post, I added the quick disconnect to my stock for slinging my Kriss. I also added a front Magpul RSA to the top rail, up near the front iron sight. I did that so I could go with either a single sling mounting point or quickly move the other end of the sling to the RSA mount for a two point carry. Is the duty belt old school? I have seen people comment that a molle belt or Rigger's belt are better. Your thoughts? Recommendations? I will change out my belt if there is a good enough argument. Using this for spare magazines, or SHTF scenarios wherein I actually use plates, could be a good one-time investment. But, I can't help feeling like the plate carrier is a bit overkill. I would rather throw a used mag in a bag than leave it on the ground for it to be fouled with mud or dirt or to have someone step on it. What is the thought process with that? I would appreciate thoughts on this.....AND PRODUCT RECOMMENDATIONS! Wastes time. Dump the mag and reload. Train like how you would fight. Just think which is faster? Dropping the mag and reloading. Vs dropping the mag and putting it in the pouch then reloading. Dont worry about dirt. You should clean your mags every once in a while. Just like you clean your gun.